It never dies until there is a political resolve to put it to death. Take the Elijah’s challenge. I will assure you that Your Christian God will NOT show up, will NOT speak up, will NOT answer your prayer and will NOT even drop a pin. He is a no show because you failed to understand the concept of…God! What???? 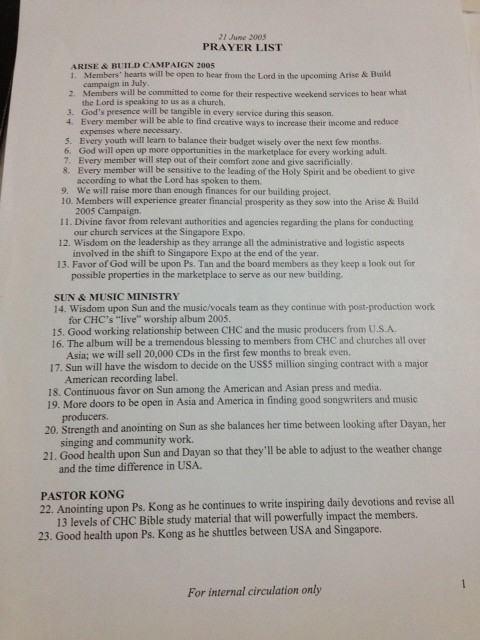 This is a church prayer list? Read the whole thing and it pretty much explains where their focus remains and why this organization is in trouble. I have seen from first hand experience the damage this kind of deception plays upon our youth and even children. They begin to worship these leaders and think this is what Jesus is all about. Once these leaders are exposed (which seems to begin happening all over the world) many of the young people determine never to step into a church again or even crack the door open to the call of God. For many of them, the rest is history. And true, this happens to many adults as well. The ripple effect of this is cruel and crushing. I think you’ll be encouraged to know that there are many genuine Christian leaders around the world and here in Australia who are committed to exposing all of this deception and rebuilding the church according to God’s design. It’s long overdue and it’s already begun. I hope that you understand that I’m not trying to contend with you, but encourage you, when I say that people will return to church in a flood once imposters like Phil Pringle and Kong Hee are driven out. There are “big frauds” and there are “small frauds”. Nevertheless, all are frauds. You need clueless people to support spiritual enterprisation in any form. Every day, a new sucker is born to ensure their survival. Kong and Sun are “big frauds” that came on the radar screen, unfortunate for them. There is just too many “small frauds” to make exposin them impractical. Furthermore, too much is at stake on the political front. Religious controversy will continue to destabilize our world. They think that religion is a way to become rich. Well religion does make a person very rich, if he is satisfied with what he has. What did we bring into the world? Nothing! What can we take out of the world? Nothing! So then, if we have food and clothes, that should be enough for us. But those who want to get rich fall into temptation and are caught in a trap of many foolish and harmful desires, which pull them down to ruin and destruction. For the love of money is a source of all kinds of evil. No need to argue. No need to read tons of books by your most proficient spiritual writers. No need to listen to your most popular, persuasive, mind blowing charismatic leaders. Let’s settle all these religious nonsense by taking up the “Elijah’s challenge”(take only one day). Name your venue, time and type of supernatural respond from heaven. I shall call it NO SHOW. Your God calls you dim witted and your religious house of cards will have to fall! They were not seeking sign for evidence (becareful of how clueless preachers insert words into the text). They don’t need convincing, they wanted to avert judgement – of it was true. No supernatural signs will be given to warn them(they were committing “adultery” with the powers). However, you can watch for the “sign of Jonas”. That said, why do you pray if you don’t believe God will or is able to answer your prayers? Whether it be for healing/miracles or to seek divine wisdom from above, shouldn’t these be regarded as evidence(signs) of his grace? Where countless lives are at stake, should he withhold his grace from the challenge? Afterall, the challenge is not without biblical basis? You see, this God cannot be related in the manner you were taught(therefore the “no show”). Going on the transcendental level will bring confusion and deadly conflicts – one of the reason why Christianity is so divided with legions of “demonic godly voices”.